The Florence Collection is the collaboration of the finest Italian paper, Rossi 1931 with Japanese hand made tea canister. 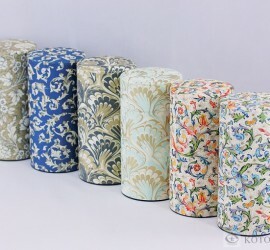 Using traditional Florence pattern paper from Italy, Kotodo hand cut and hand wrapped the paper piece by piece to each tin. Enjoy the luxury of both Italy and Japan tradition at your home.